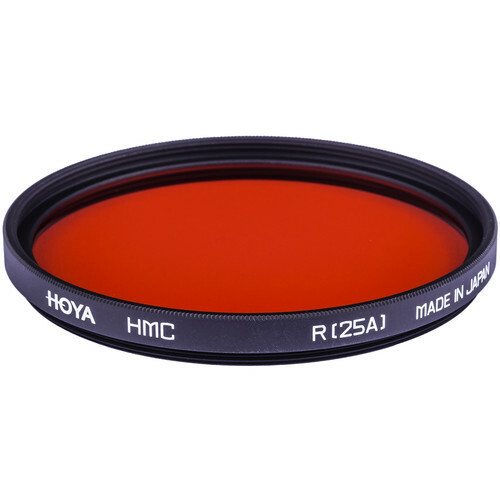 This 46mm Red 25A Filter from Hoya is ideal for strong contrast improvement since it absorbs green and blue completely and enhances red. Clouds are dramatically improved almost to the mood of a thunderstorm. It is more effective in cutting through haze, and moonlight effects are easily accomplished. When used in combination with a polarizer, a sense of an impending storm can be created. It is also suited for infrared photography. Multi-coated to minimize reflection at the filter surfaces which reduces flare and ghosting. Hoya multi-coating results in about 97% light transmission. Color is truer and contrast is maximized. Box Dimensions (LxWxH) 3.5 x 2.8 x 0.45"